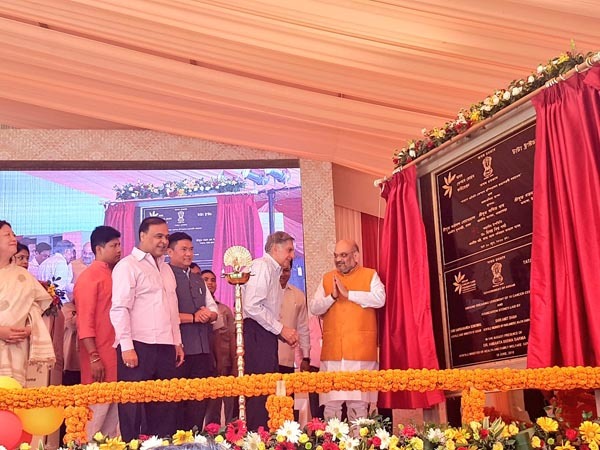 BJP President Amit Shah who landed in Guwahati on Monday morning to attend the State government’s function at the Veterinary College ground, Khanapara, laid the foundation stone of 19 new cancer centres. Tata Trusts Chairman Ratan Tata and Chief Minister Sarbananda Sonowal and State Finance Minister Himanta Biswa Sarma were present at the ceremony. BJP President Amit Shah, Tata Trusts Chairman Ratan Tata and Chief Minister Sarbananda Sonowal jointly lit the ceremonial lamp and formally launched the Assam Cancer Care Foundation. The foundation aims to make cancer a manageable disease by reducing mortality through awareness, prevention and early detection. Shah was received by Assam Chief Minister Sarbananda Sonowal at LGBI airport here. Sonowal welcomed him with a phoolam gamosa. BJP President Amit Shah complimented Assam for having taken this unique initiative for cancer care. He also lauded role of Tata Trust’s in helping people in India as well as Ratan Tata for his personal commitment towards philanthropy. Arunachal Pradesh Chief Minister Pema Khandu who was present at the ceremony expressed confidence that this layered intervention program will immensely help the region including his state, which unfortunately has seen a spurt in the cases of cancer. The first installment of Rs 500 crore, Rs 250 crore each by Government of Assam and Tata Trust was handed over to Assam Cancer Care Foundation (ACCF). Under Assam Cancer Care Foundation (ACCF), a South-East Asia Cancer Research Institute will be set up at Cancer Hospital, GMCH, Guwahati. Also a Level One facility at AMCH, Dibrugarh will be established with advanced treatment and education facilities. ACCF will also set up 12 Level 2 centres with comprehensive oncology services including palliative care facilities next to Government medical colleges in Barpeta, Dhubri, Jorhat, Karimganj, Kokrajhar, Lakhimpur, Nagaon, Nalbari, Silchar, Tezpur and Tinsukia. Under ACCF, Five Level 3 centres with screening, diagnostic and day-care services will come up adjacent to District Hospitals at Daring, Goalpara, Golaghat, Haflong and Sivasagar.